While Glacier National Park is not located in Washington State, it’s a popular getaway spot from Seattle. Not that Washington doesn’t have its fair share of beautiful places, but Glacier National Park is a stellar and special place often called the Crown of the Continent. View wildlife like Grizzly bears and moose, but also smaller critters, as well as native plant and bird species. 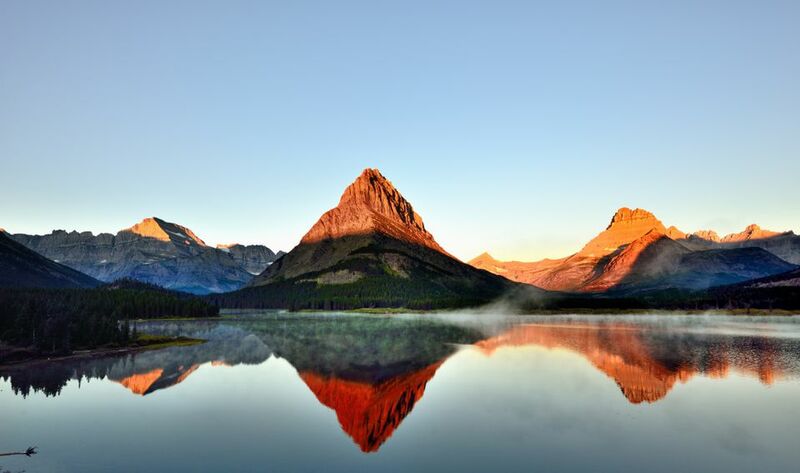 Glacier, along with its neighbor Waterton Lakes National Park across the border in Canada, are both designated Biosphere Reserves and World Heritage sites. Of course, most people want to see some glaciers up close when they visit the park, and visitors can do just that as well as learn about the history of glaciers in the area. Many of the features of the mountains in the park were formed by glaciers, and you can see glacial retreat up close and personal here. Glacier National Park is not too far away from Seattle, located in northern Montana, meaning this national park is easy to get to. But even better, there are a few different ways to get there, each of which offers a unique experience. Plan on spending at least three days for your trip—longer if you drive or take the train. Driving from Seattle to Glacier National Park takes just long enough to have an adventure, but isn’t so long that the kids will be miserable or you’ll run out of patience for the journey. At between a 9- and 10-hour drive, the drive can easily be done all in one day if you just want to get it over with, or you can break it into two days and enjoy some sights along the way—and there is indeed some very cool stuff to see and things to do along the way. The most direct path between the two points is to take I-90 from Seattle and into Montana, and then turn off at MT-133 and continue from there onto MT-28 E and US-93 N to get to the park entrance. It’s I-90 where most of your adventure awaits. Between Seattle and Spokane, there’s a number of things to stop and do, including exploring (or at least snapping a few photos of) Snoqualmie Falls, sampling fresh fruit at road stands in Eastern Washington, catching views from the Wild Horse Monument overlooking the Columbia River, or stopping for wine or a spa treatment at Cave B Winery. Even with a few stops, you can make it to Spokane by nightfall and stay the night. Spokane is roughly the halfway point. Perhaps the most interesting way to get to Glacier National Park from Seattle is to take an Amtrak train. You can board the train right at King Street Station in Seattle, and the train delivers you to the West Glacier Station within the park bounds. The train ride is a bit slower than driving at 14.5 hours. The best train to take is the Amtrak Empire Builder, which offers a direct route versus other itineraries that may have you switching trains or even getting onto a bus (and extending how long the journey will take). Riding the Empire Builder, you can choose from coach seats on the upper or lower level of the train or a Superliner Roomette—go for the roomette if you can at all afford it. Having some space to spread out and relax makes all the difference in turning a train ride from tedious to fun. Roomettes have meals in the dining car included, and the seats convert into beds to sleep for the night. Along the way, you’ll enjoy views of rugged landscapes and open skies, especially after you get out of Western Washington. You can even book packages that combine a train trip with hotels and tours of the park if you want to have all the details squared away in one go. Of course, if what you seek is the shortest, sweetest way to get to Glacier National Park so you have more time to spend at the park itself, flying is the only way to go. Sure, you’ll skip out on adventures and scenery along the way, but you’ll also be at the park gates in a couple of hours. From Sea-Tac Airport, you can catch flights to one of a few airports in the vicinity of the park—Glacier Park International Airport in Kalispell, Montana, is about 30 miles from the West Entrance; Missoula International Airport is 150 miles from the West Entrance; and Great Falls International Airport is about 150 miles from several of the park entrances. Once you land, car rentals are available at all of the airports, or you can catch a shuttle to the park from Glacier Park International Airport.